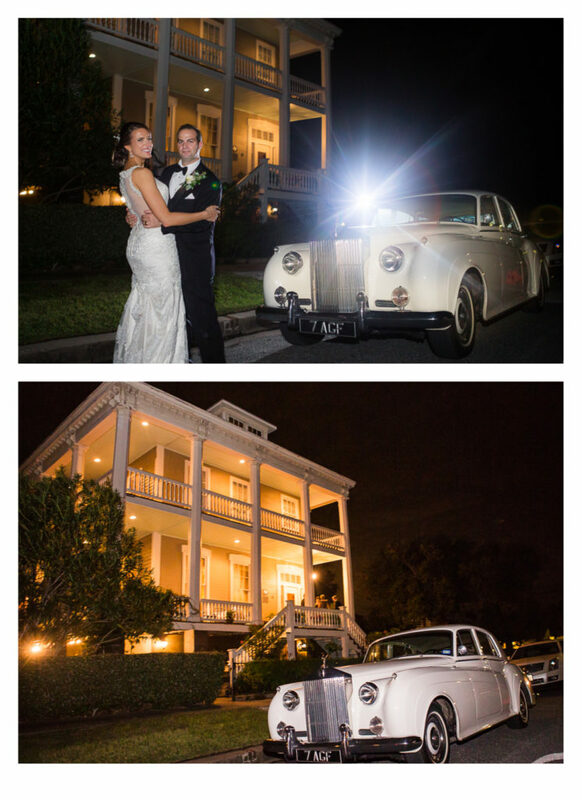 Elizabeth and Hunter had a beautiful wedding at the Lasker Inn bed-and-breakfast on Galveston Island. 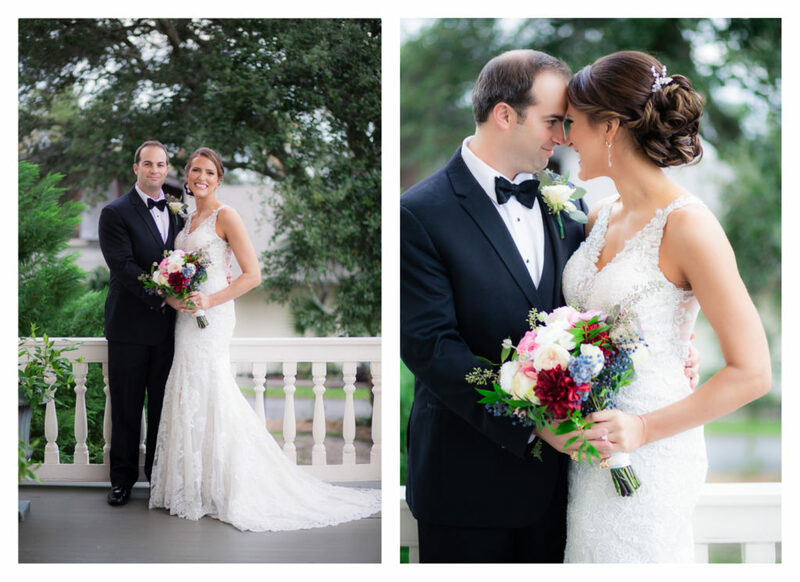 Elizabeth and Hunter traveled from out of state for this wedding on Galveston Island, and most of their guests traveled from all over the United States- from the East coast up in Maine to the West Coast in California. 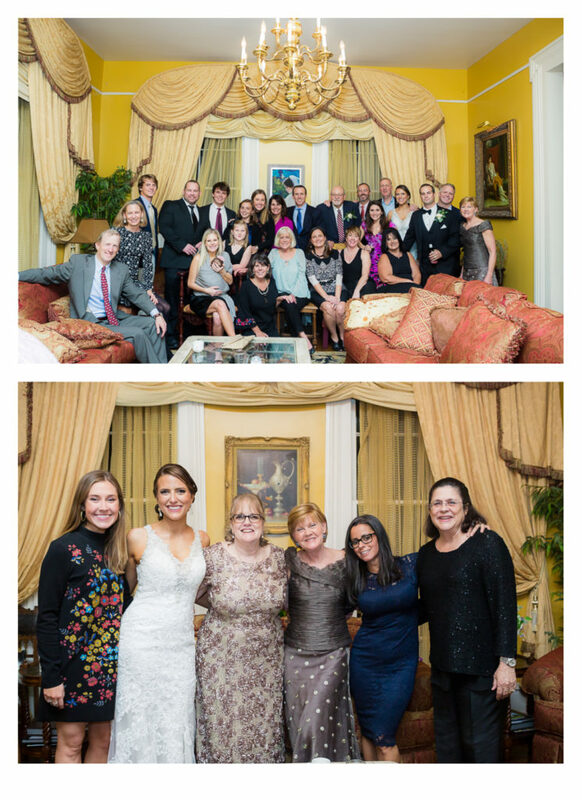 Everyone from both families had such a great time together, and it felt like everyone was on vacation having fun! 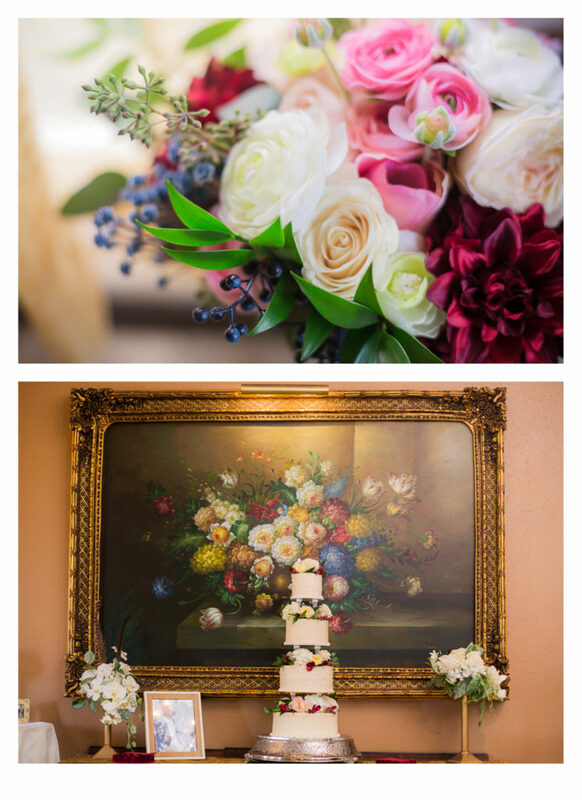 I love working at the Lasker Inn – they always do such a great job. 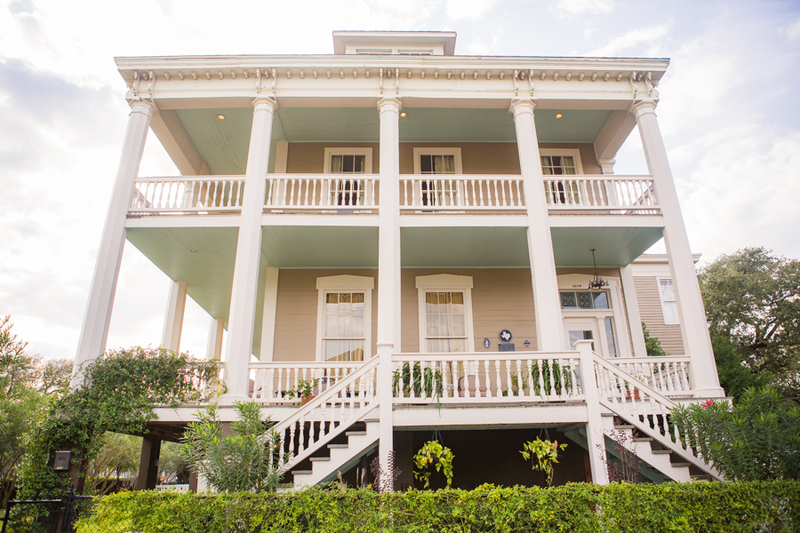 The Lasker Inn is a Galveston historical home and is filled with beautiful antiques and paintings curated by the owner. 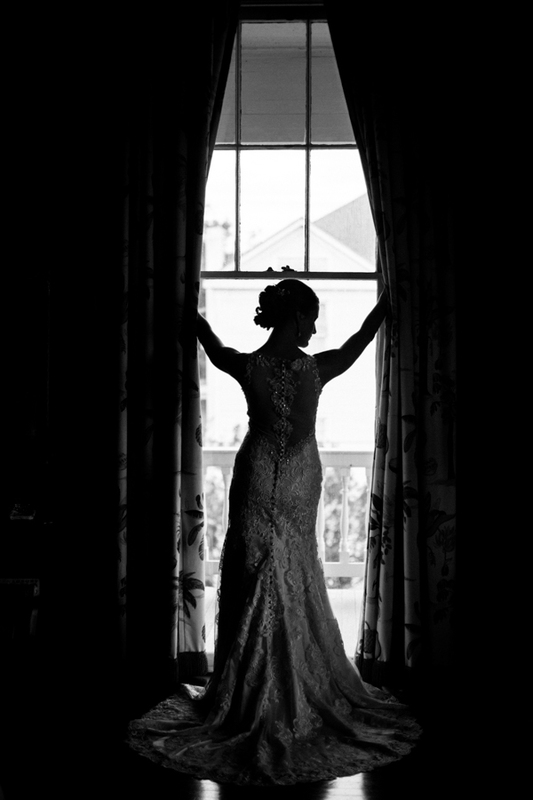 I had never met Elizabeth before wedding day. We had only visited a couple times over the phone and through several e-mails! Elizabeth voiced her concerns to me about having a wedding for 100 guests at a bed-and-breakfast. I have to admit I was a little nervous myself, but I knew the Lasker Inn always does a fantastic job. And the crazy thing is, after the wedding was over, I think the Lasker Inn would have been able to accommodate even more guests! The Lasker Inn knocked it out of the park. They do have to flip the room from the cocktail hour into a dining room, but they have a team and are very efficient. 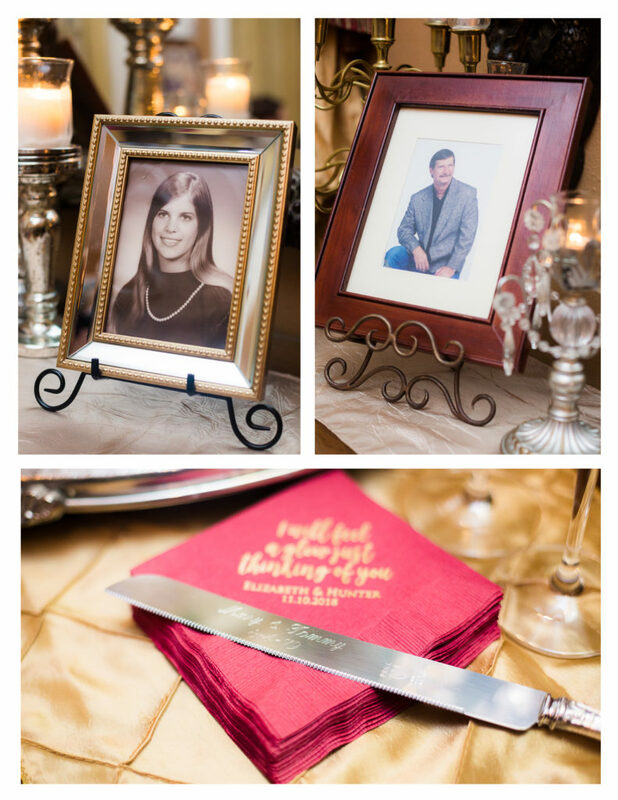 It was important for Elizabeth and Hunter to incorporate their parents and grandparents and their memories into the wedding day. Also, Elizabeth wanted to make sure her two sons James and Henry had an important part in the celebration. 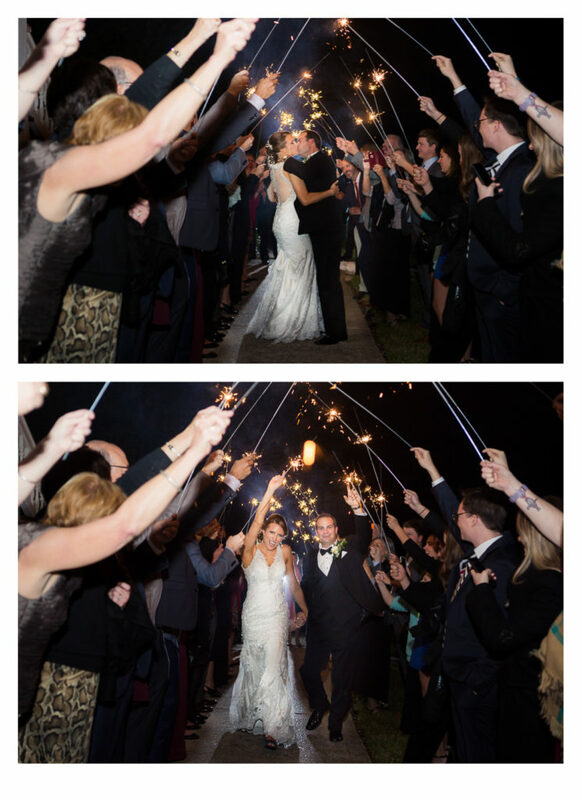 This wedding was more than a union of two people, it was the union of a family. 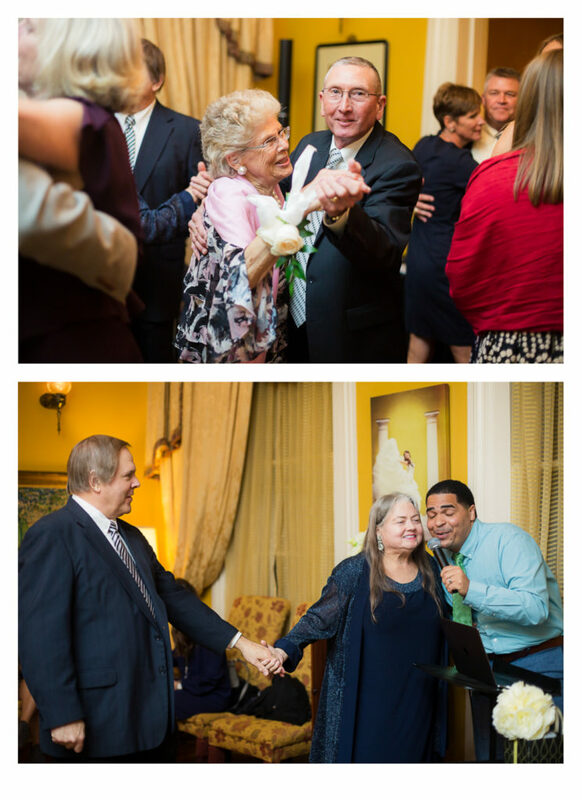 Many family members voiced the relief that this wedding was finally happening. I think everyone knew these two were meant for each other. 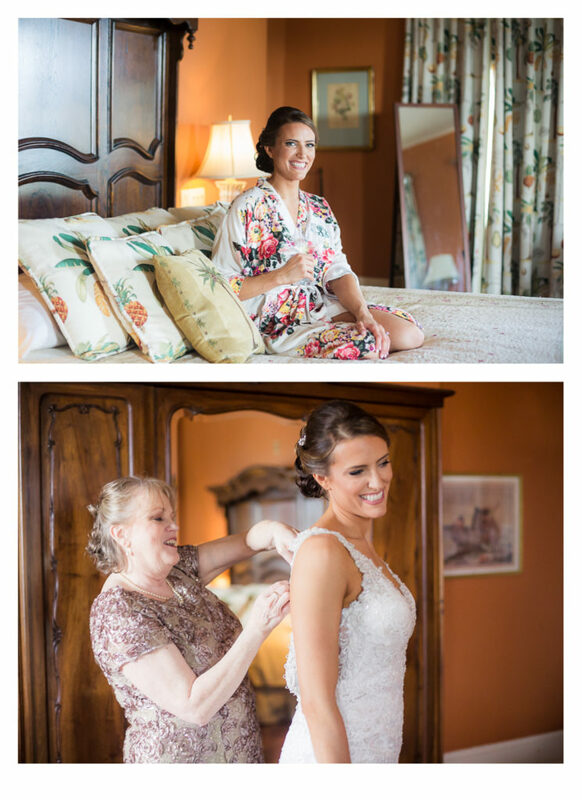 I spent a lot of time photographing Elizabeth and Hunter’s wedding day details, because so many of them had a very special family history. Elizabeth had three family rings tied to her bouquet. 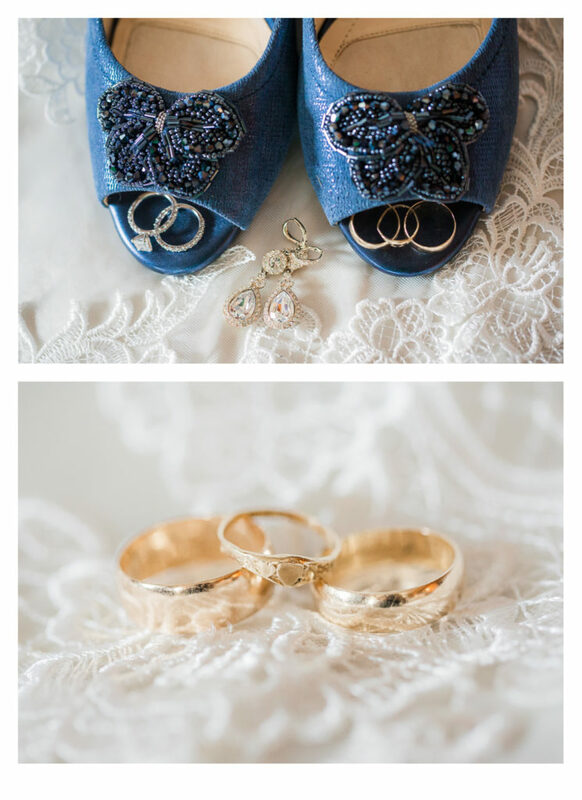 One was her grandmother’s wedding ring, one was her Mother’s wedding ring, and one was a ring her father gave her. 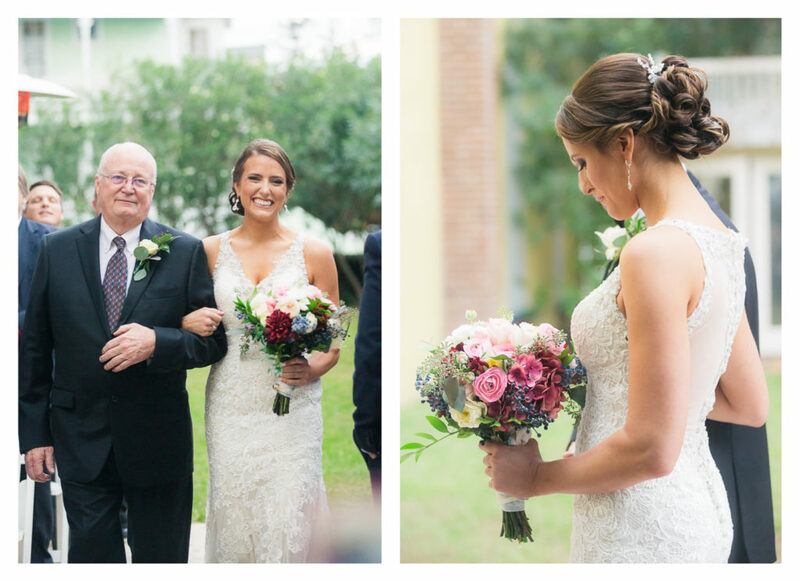 Her Father had passed away making the rings that much more important to have walking with her down the aisle. Elizabeth was full of joy the entire wedding day. 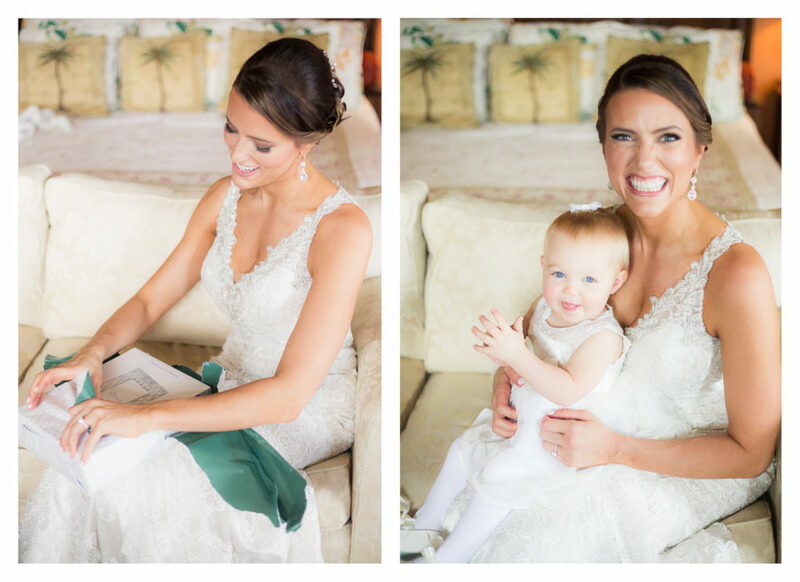 She was so happy to be marrying Hunter and really enjoyed the day. That makes me so so happy too. 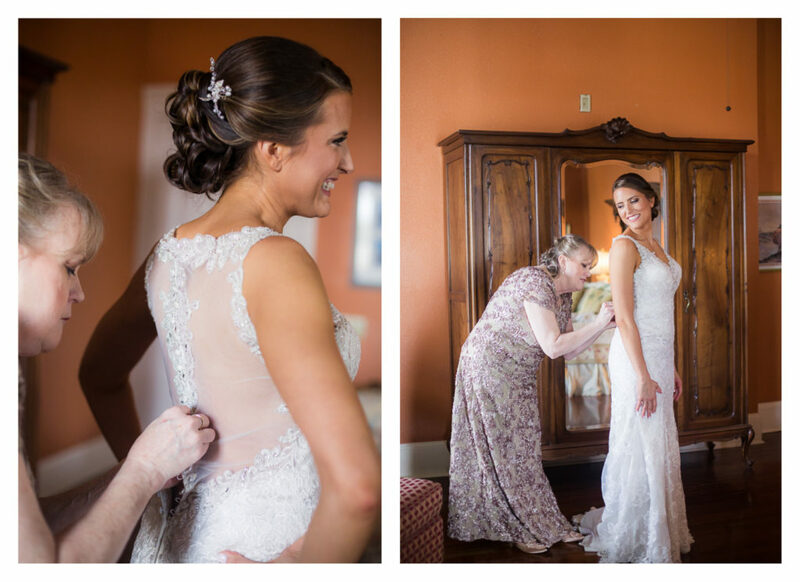 Elizabeth got ready with her sweet friends and Mom – she looked absolutely gorgeous in her wedding gown. 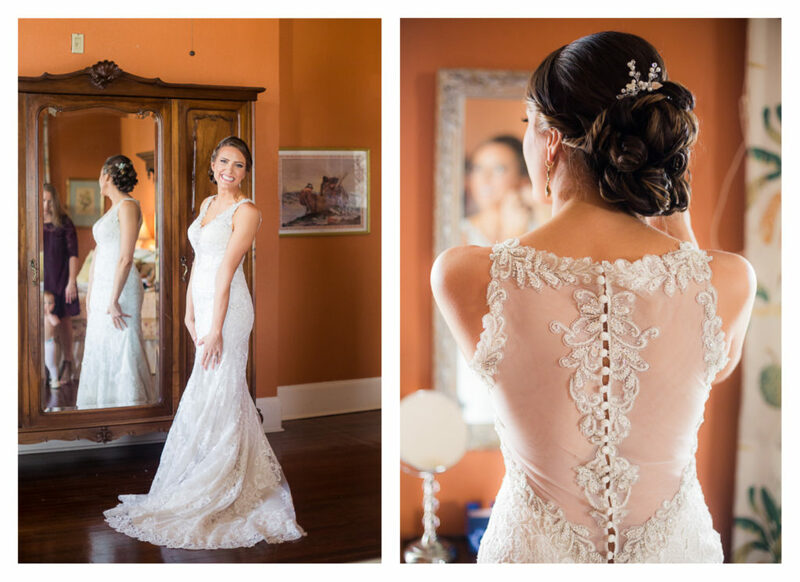 The dress was perfect for her, and her hair and makeup was flawless. Hunter had a pretty special ring as well. His Mother had passed away when he was young, but her memory was very much present for many, many guests in attendance. 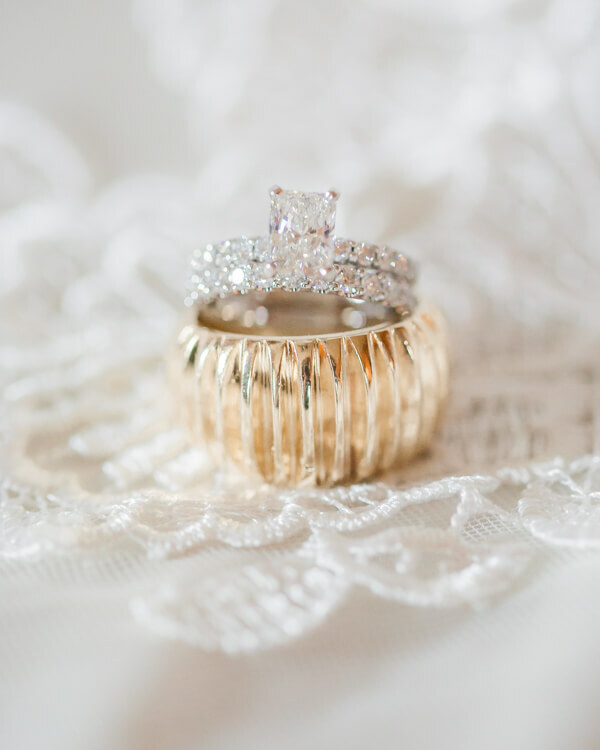 Her memory was honored in many ways at the wedding, but Hunter’s wedding ring has to be the most special. 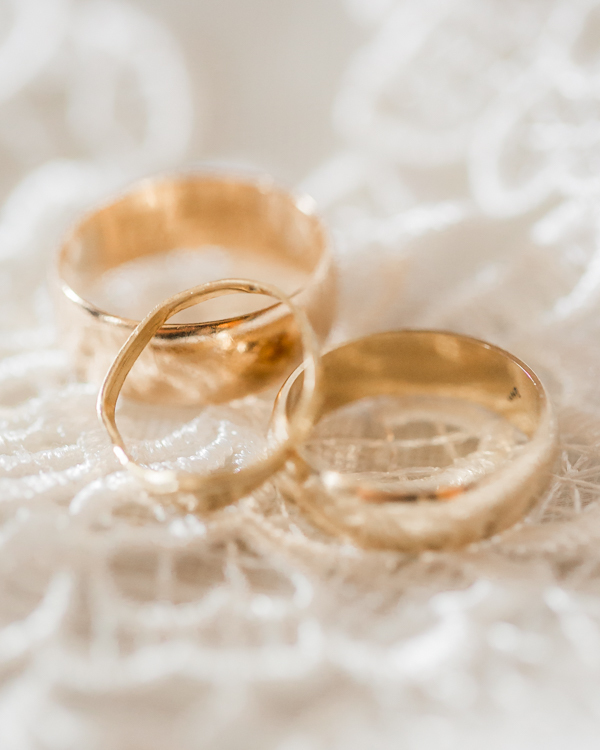 Hunter’s father gave Hunter his wedding ring before the wedding day as a gift. 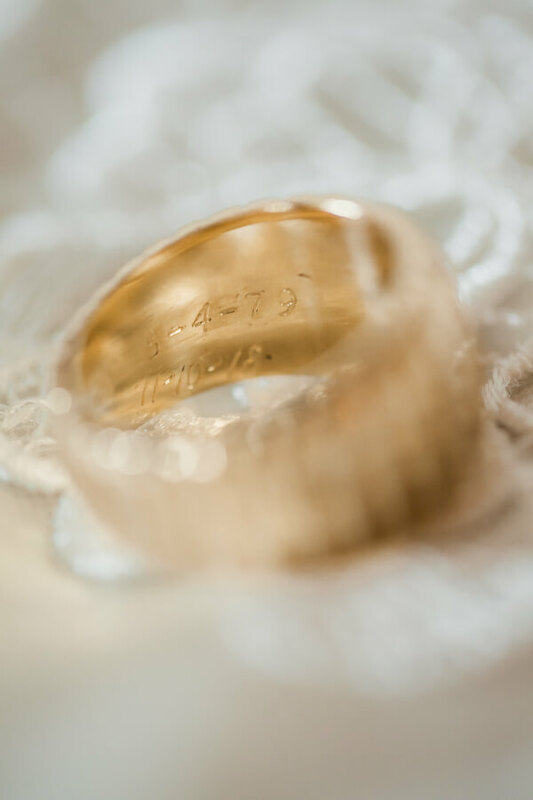 It has his mother’s initials engraved inside with their wedding date and “All my love.” Hunter’s father also had it engraved with Hunter and Elizabeth’s wedding date under the date of Hunter’s mother and father’s wedding date. And Hunter gets to wear this ring everyday as a reminder of that. If it couldn’t get anymore special, Hunter’s Mother’s name was Mary and Elizabeth’s name is Mary Elizabeth. Mary was definitely a very special name at this wedding. 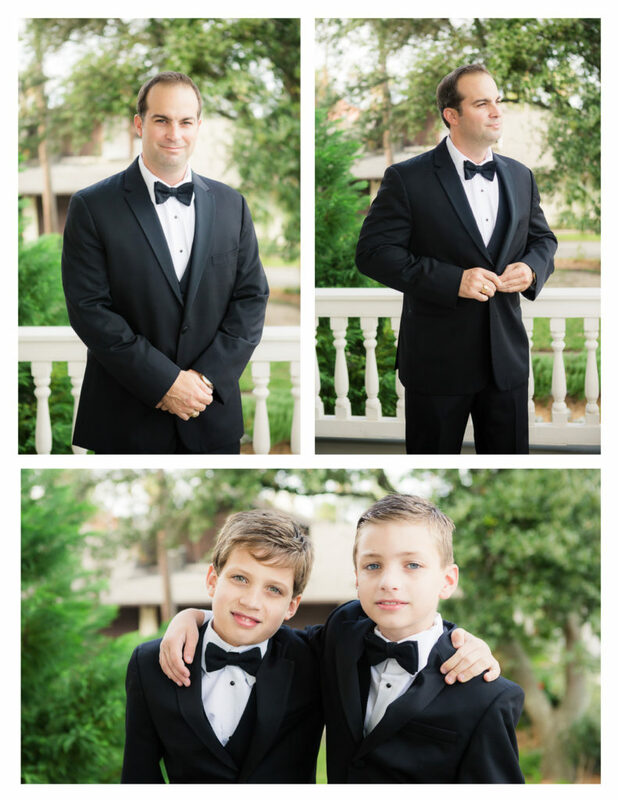 I was able to capture some great shots of Hunter getting ready looking so dapper in his suit, as well as the other handsome men of the day, Elizabeth’s sons Henry and James. Elizabeth told me that the moment Henry and James were looking forward to most was when they first saw their Mom in her wedding dress. That just melted my heart. We had a first look with the boys and their Mom, and it was such a special moment to witness. 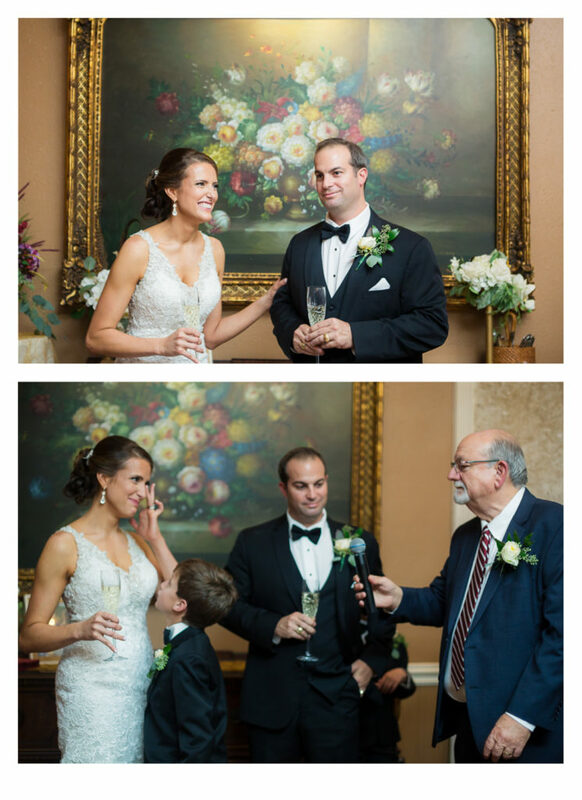 Hunter gave Elizabeth a crystal photo frame as a gift on her wedding day. I think they will have a lot of options of what photo to put in that frame! 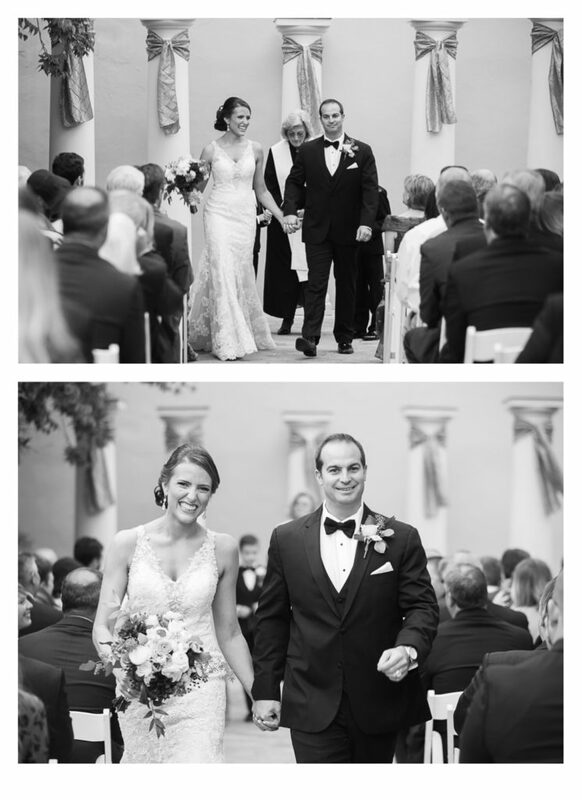 Elizabeth also had a first touch with Hunter just before walking down the aisle! 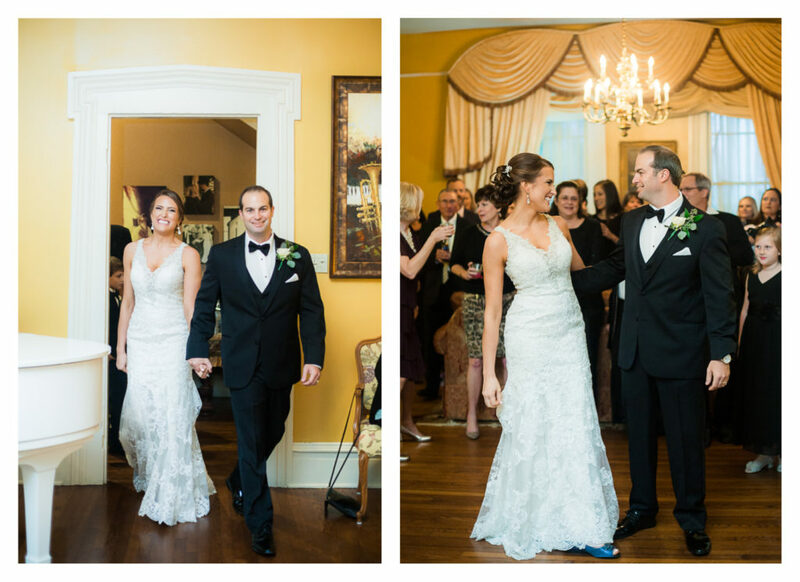 Hunter said when he saw Elizabeth walking down the aisle he couldn’t breathe. I have to say I’m not surprised! 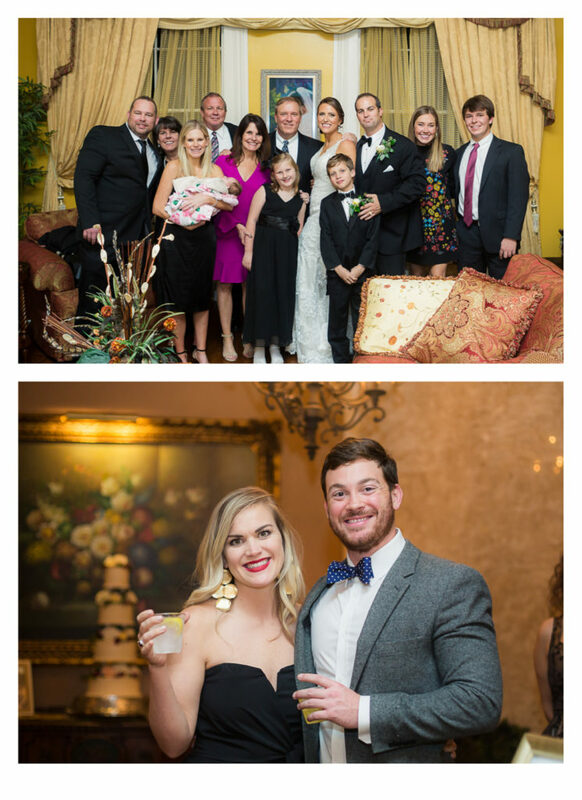 During the ceremony, Hunter gave Elizabeth’s sons each a Saint Christopher Medal, and they carried it around for the next hour showing everyone at the reception. This is a medal is carried or worn as a sign of protection. Hunter had one that was a special gift he received when he was young, and he wanted to give one to Henry and James on this special day. After ceremony, we took family photos, and then rushed up to the rooftop on top of the Lasker Inn. 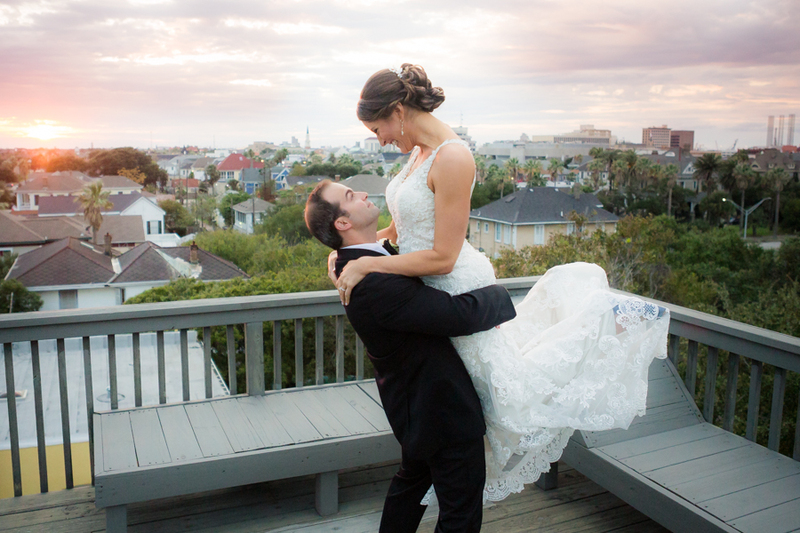 We just caught the sunset overlooking all of Galveston Island, and what a great wedding day memory right before starting the reception celebration! I love the environment at the Lasker Inn, because it feels so warm and welcoming . Everyone can’t help but have a great time. Elizabeth and Hunter had such a unique DJ/singer. I have to mention him just a little bit just because it was a bit of a unique experience that I had never really seen before. They DJ sang wedding songs live on a microphone as well as DJed from a computer depending on the genre of music. I would highly recommend this DJ, but he is definitely not like the typical DJ. He has a beautiful beautiful voice and it just creates so much more intrigue especially during the cocktail hour for Elizabeth and Hunter. So this was really a hybrid DJ and live singer together. I think it was very popular with the crowd especially for the really classic romantic songs. 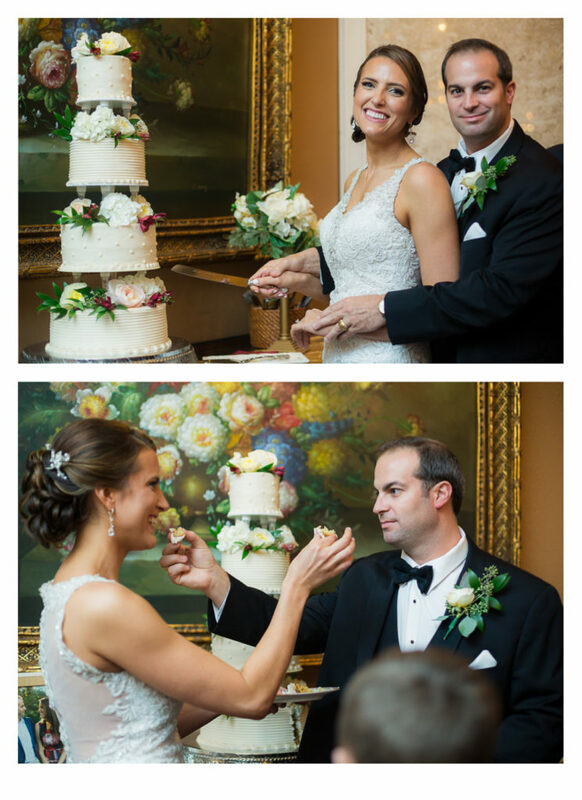 Elizabeth and Hunter also used the same cake cutting knife that Hunter’s Mother and Father used on their wedding day. 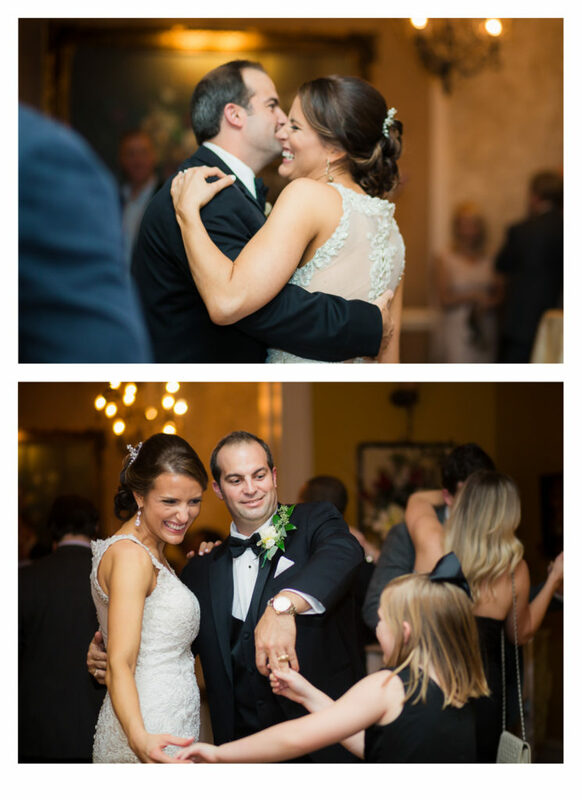 After Elizabeth and Hunter’s entrance, they shared their first dance then had a sit-down dinner followed by some beautiful toasts from Hunter’s father and Elizabeth‘s Aunt. 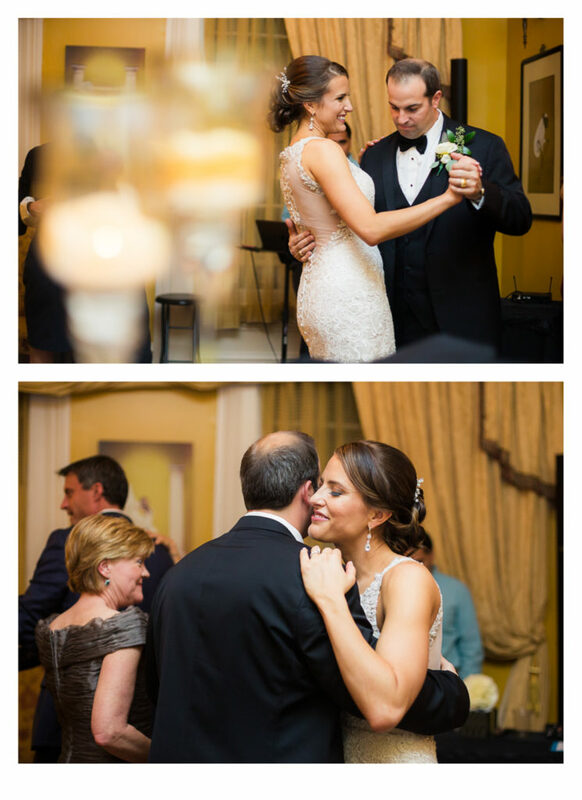 Elizabeth shared a dance with her two boys to Ain’t No Mountain High Enough. I think one of the reasons I like working at the Lasker Inn is that I just know that the environment is more relaxed. People are sitting on the couches and it’s just a really warm, relaxing atmosphere. 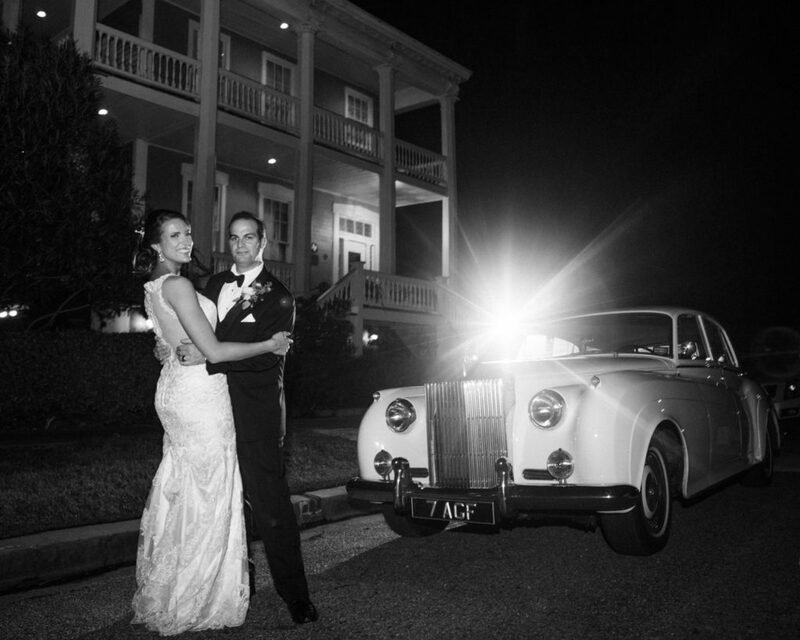 The couple had sparkler exit and left in a white Rolls-Royce. It just reminded you of a Hollywood fairy tale. 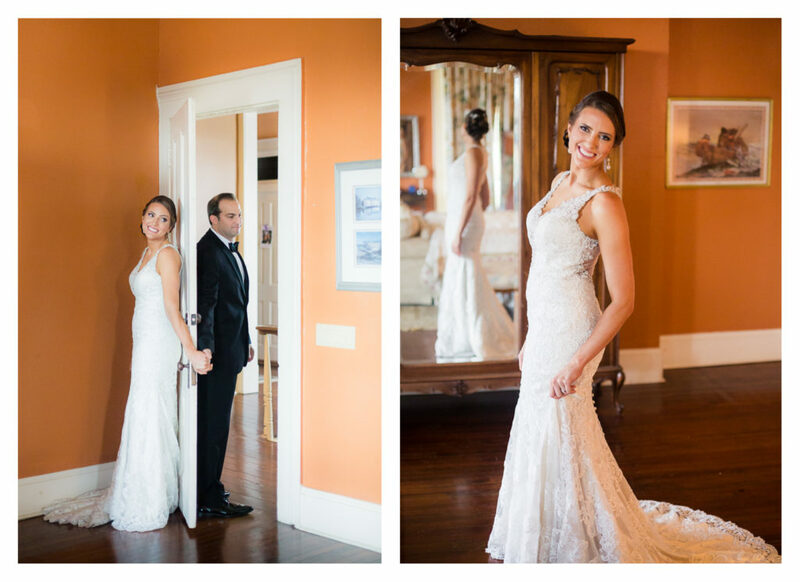 Elizabeth and Hunter were so wonderful to work with, and I had a blast at their wedding too. I was even able to enjoy visiting with their sweet friends and family throughout the night. 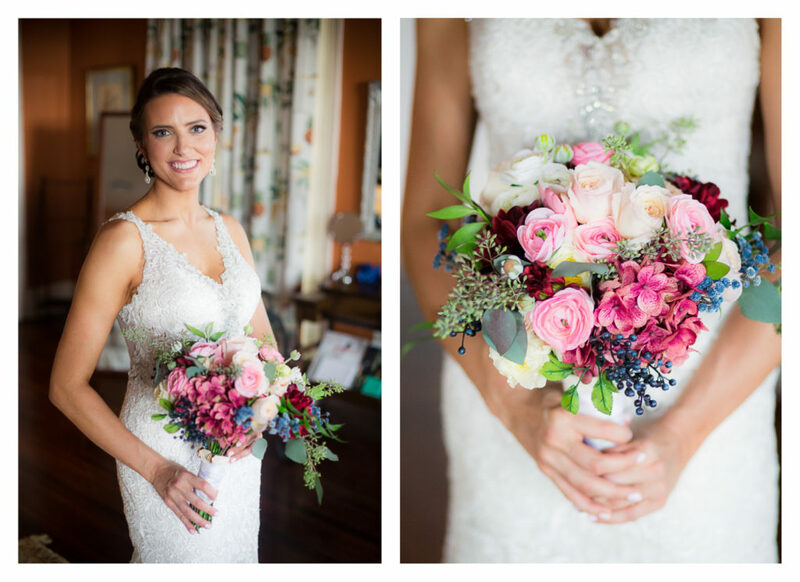 FEATURED ON WEDDING CHICKS BLOG! 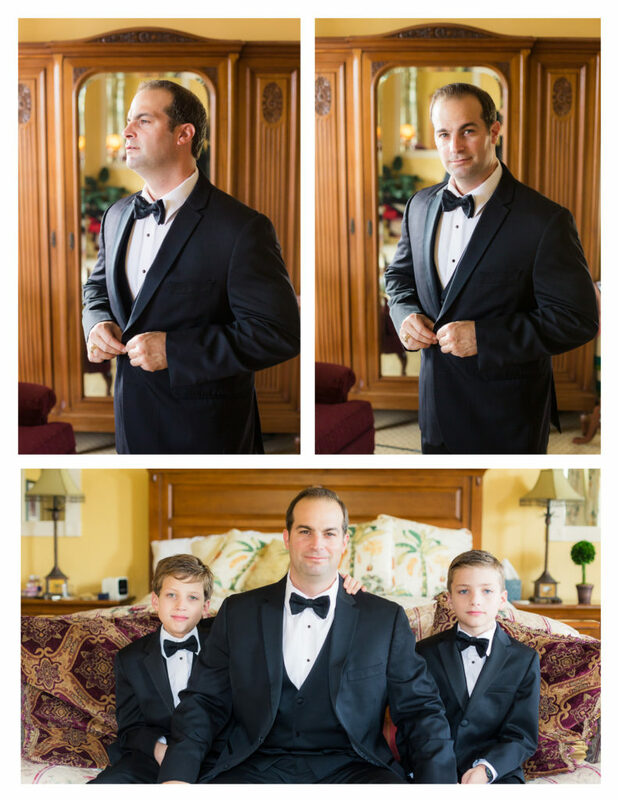 My goal is to provide you with timeless Wedding photographs that you will cherish for a lifetime.